If you’re searching for the best work boots for flat feet, you’re in the right place. 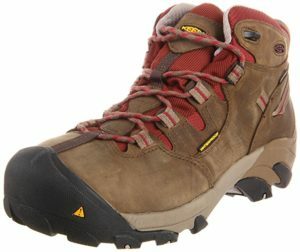 On this page you’ll find our experts’ top work boot choices for both men and women, as well as a little more information about each of their picks. Selecting the best work boots for flat feet is an important decision: if you or your loved one spends most of their time working on their feet – especially in the harsh environments that require the use of work boots – simple issues like flat feet can turn into serious and painful problems. That make your search easier, we’ve put together a list of the 6 top picks of the best work boots for flat feet for both men and women: 3 diverse and unique boots for each. So sit back, check out our experts’ top picks, and rest assured knowing you’re on your way to a much higher level of foot comfort. 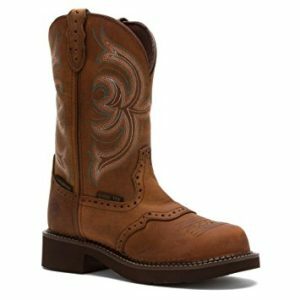 Designed with the utmost in comfort in mind, the Justin Original Double Comfortable 4760 is a great cowboy-style work boot for men who suffer from flat feet. This pair of boots is a smart choice for anyone spending a good portion of their time standing, lifting, and carrying, as they provide enhanced support meant to aid in long-term use. 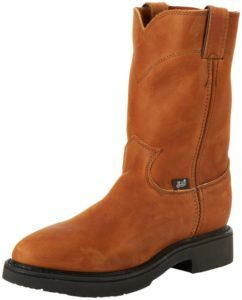 Reasonably priced compared to many of the other comparable boots out there, the Justin 4760 is still a top competitor when it comes to long-lasting durability and how well they retains their quality of comfort over time as they’re used and worn in. Searching for a mid-rise work boot that will hold up in even the harshest work conditions? The Timberland PRO Pit Boss 6” Soft-Toe is an expertly-crafted work boot which features a padded collar and cushioned insole to help wearers suffering from a range of common foot conditions, including flat feet. Crafted with comfort in mind, the Timberland PRO PitBoss features a roomy toe box, a removable insert, and a removal sock liner. They also feature Timberland’s proprietary 24/7 Comfort Suspension system for maximum relief. 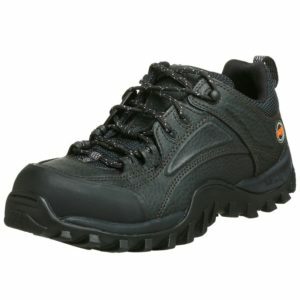 These boots offer the perfect solution for anyone after the perfect blend of safety, functionality, and comfort. Need a low-rise boot that offers the same level of protection as a full-size, but also comes with the built in comfort required for someone who suffers from flat feet? Also from Timberland, the Timberland PRO 40008 Mudsill Low Steel-Toe makes long work days far more bearable. Boasting a safety-enhanced steel-toe, as well as shock diffusion thanks to Timberland’s 24/7 Comfort Suspension technology, these are easily the best work boots for flat feet for men who need a low-rise option. As with all Timberland PRO products, the 40008 Mudsill boots are crafted from only the highest quality materials in order to survive the active work environment and still last for a long time. These are a great pick for anyone who seems to go through work boots quickly. It can be tough trying to find a high-quality pair of steel toe work boots for women with flat feet – many of the options don’t provide the durability and support required in the serious workplace. Luckily, the Justin Gypsy Waterproof Steel Toe Work Boot is the exception to this trend. Featuring aged leather uppers and an interior waterproof bootie, the Justin Gypsy also contains a removable J-Flex Flexible Cushion System insole in order to provide support from the moment you get to work until the moment you take your boots off at the end of a long day. A smart buy for the woman seeking a mid-rise boot with steel toe safety, the KEEN Utility Women’s Detroit Mid Steel Toe Boot features a built-in dual-density compression insole that provides torsion stability for long-term users with flat feet. Great for industrial settings, the KEEN Utility Detroit is made for both comfort and long-lasting quality. 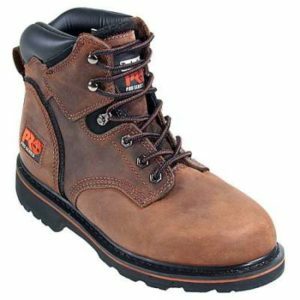 These boots comply with a wide range of safety standards, including steel toe, waterproof, and electrical hazard, and are built with high-end materials designed for strenuous use. In addition to flat feet, these boots are also great for buyers who suffer from heel spurs and typically have trouble finding a pair of comfortable work foots for daily use. By now, we’ve already discovered that Timberland is one of the best manufacturers of work boots for men, so it should be no surprise that a pair of their women’s boots have made the list as well. The Timberland Women’s 6” Premium Boot provides all of the comfort, durability, and protection found in their men’s boots, just specifically designed for the feet of a woman. One of the best work boots for flat feet for women, the Timberland 6” Premium is waterproof and lined with a heavily-padded collar for extra comfort. 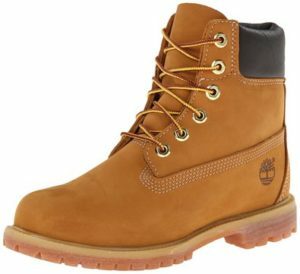 Easily Timberland’s most famous and recognizable classic style, the 6” Premium is widely known as one of the all-around best pair of work boots out there. InsolesAndInserts.com is a participant in the Amazon Services LLC Associates Program, an affiliate advertising program designed to provide a means for sites to earn advertising fees by advertising and linking to amazon.com. In addition to our affiliation with Amazon, InsolesAndInserts.com may also earn commission for purchases made through some, but not all, of the other links on the site.